I'm getting ready for Star Wars Celebration Orlando. I'm getting packed. I'm getting my route laid out. I'm loading up my phone with Star Wars podcasts. Once that is done, my only concern is how to spend my time while there. There are many great panels to see, and I will have free time just to view the fantastic exhibits. The best part, however, will just be interacting with other interesting Star Wars fans. How can we do that? 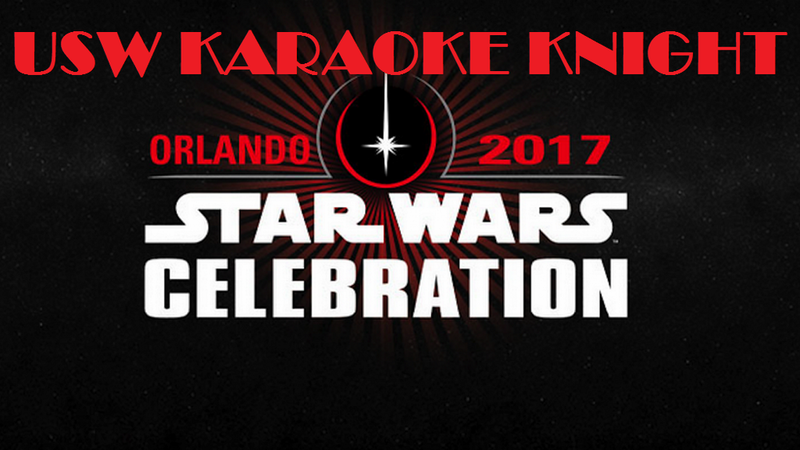 We're going to find a karaoke cantina in Orlando and have the best Jedi Night of our lives. What could be more fun than getting together with listeners to the podcast, let flow the taps, and sing all the Star Wars related songs. First will be our leader. The only person who can match Michael Jackson as seemingly an introvert, yet can set a stage on fire with the sheer force of his personality is Jeremy. Therefore, he will be performing "Smooth Criminal." Don't be late. You don't want to miss this performance. Up next will be Devin because it takes the bravery of someone who has served in the U.S. military to follow the dynamic stage presence of Jeremy. Devin will be doing a rendition of "Mr. Roboto" by Styx, the band he wanted to see so badly that he dropped all his school work and flew across the country for one of their shows. He even snuck backstage to see the band. The song will serve the purpose of giving a very special domo arigato to C-3PO on his 40th anniversary on screen. It will be so good he may even be asked to repeat it at the Anthony Daniels panel. Eve and Beks will be doing a duet of the Simon and Garfunkel classic, "The Sound of Silence." Tyler will follow that up with Billy Idol's "Rebel Yell." So come on down and joins us. You can do your own Star Wars related karaoke. After the first person does the Bill Murray Star Wars song, we may be out of actual Star Wars songs. No matter. We will improvise. We can change Sisqo's "Thong Song" into the "Thrawn Song." We may have to open up to science fiction songs in general. The Beastie Boys' "Intergalactic" comes to mind. Weird thing about that song is that it contains the line, "Like a pinch on the neck from Mr. Spock." This is the same band that wrote "Sabotage" which young James Kirk was listening to as he trashed his uncle's vintage car. It is conceivable that Kirk had heard "Intergalactic" as well. I wonder what went through his mind the first time he saw Mr. Spock actually pinch someone's neck?